Conveyance is a book share station, designed to translate the transformative properties of reading into an immersive inhabitable environment. The simple rectangular volume of a book hides a world of information within that can transform a person’s experience. Similarly, inside of this simple, singular shell exists a vivid three-dimensional interior that represents the complexity and depth of human experiences and emotions through reading. 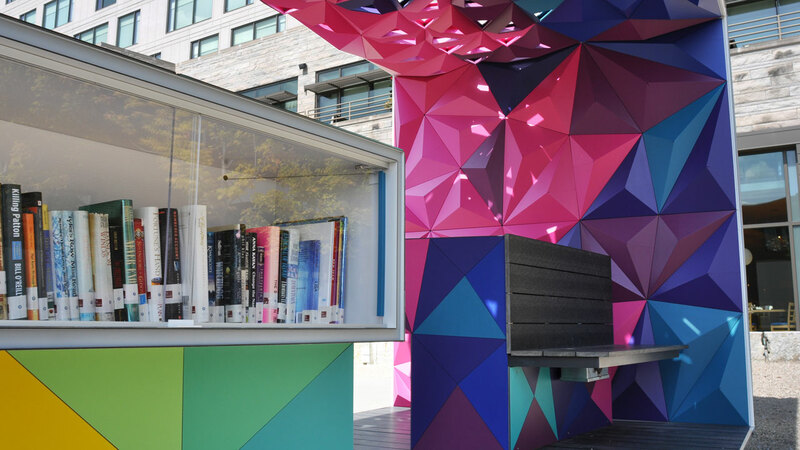 This project was commissioned by The Public Collection, a public art and literacy project consisting of artist-designed book share stations. It was developed to increase access to both books and art. The project aims to improve literacy, foster a deeper appreciation of the arts, and promote social and educational justice in our community. The book share stations are free and available to everyone. The project will be sited outside of The Alexander at CityWay along South Street. As the project is sited directly adjacent to The Alexander, it was important that it have a presence that compliments the collection of art that exists inside the hotel. The works are graphically interesting and visually impactful, framed and balanced by less complex architectural forms. This project takes a similar approach, where geometric shapes of a wide color range contrast a simple white volume. 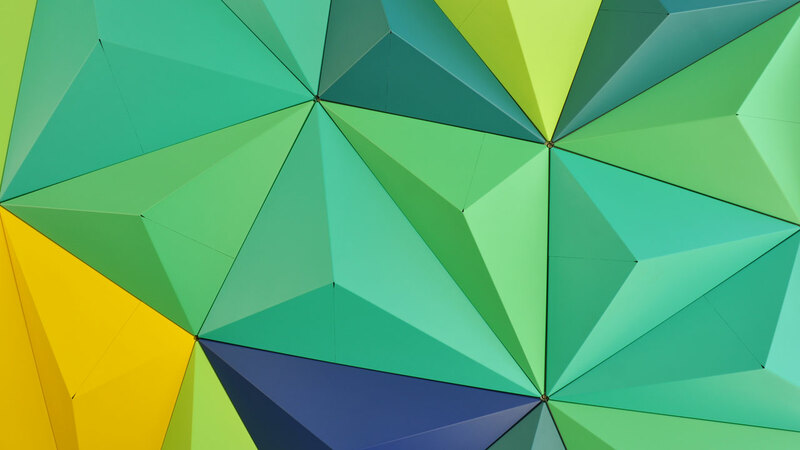 The interior form consists of a triangulated network, where each pyramidal shape extrudes more as is gets higher in the space. At their highest they become truncated, and sunlight is allowed to penetrate the volume. 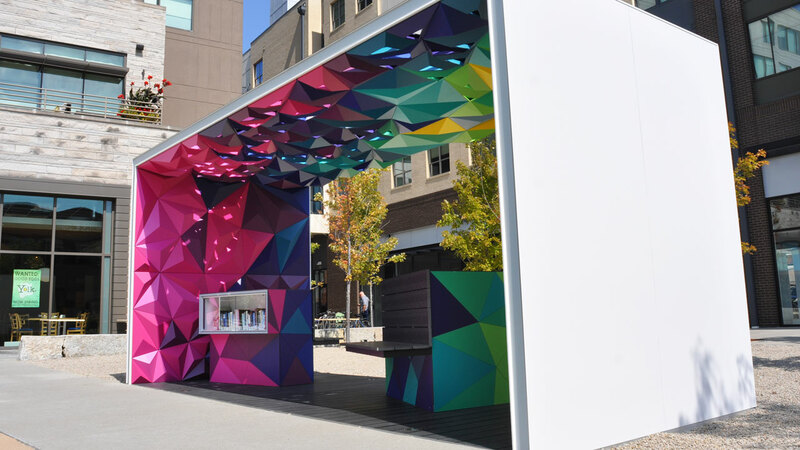 The color transitions from magenta to cyan to yellow as it wraps the interior and onto the book storage, allowing the project to be experienced in various ways, from multiple vantage points. Integrated low voltage lighting is embedded in the deck to up-light the interior at night, activating the project throughout the evening. 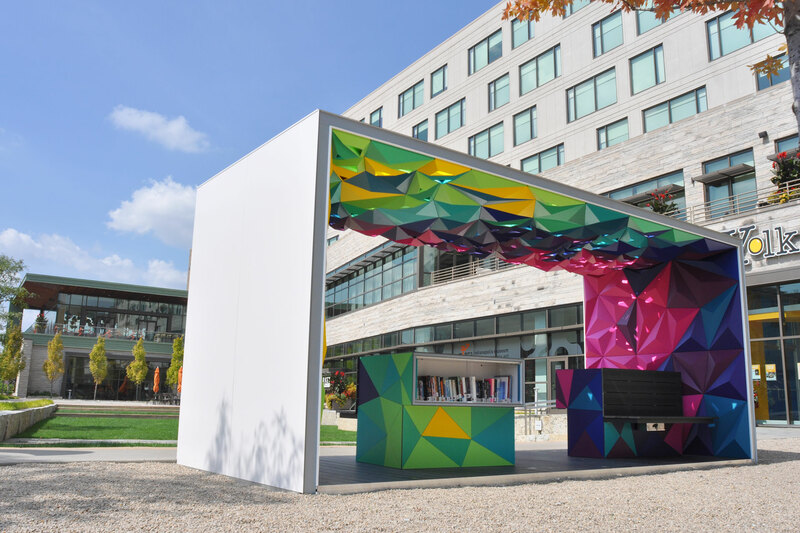 While it is seen and easily accessible by users from South Street, the project’s placement on the site also acts as a visual backdrop for potential events in the lawn of The Alexander. The scale of the project allows for multiple people to occupy the space, and the placement of the book storage units provides access from both sides of the project. Integrated seating elements will provide a temporary place to rest while perusing the books available. The project is intended to attract new users for The Public Collection project, and provide a new experience. 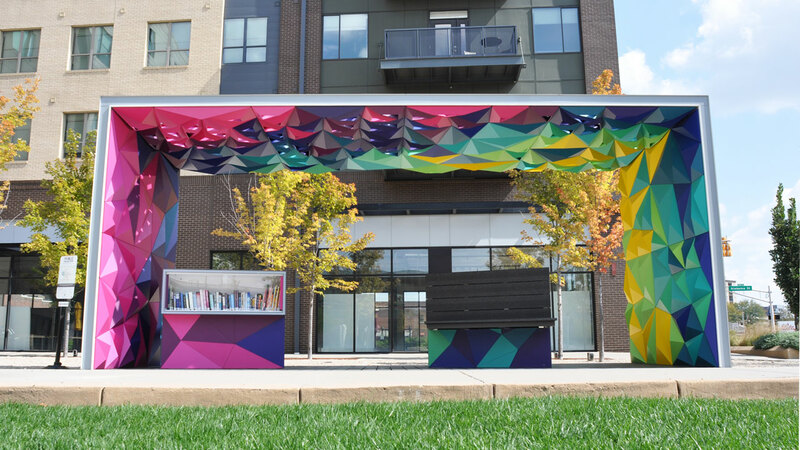 We are very excited about this project and think it is a great addition to the public art of the city of Indianapolis, The Public Collection, and The Alexander.